Over time, no matter how much you take care of your bathtub, it will stain because of the hard water. And you think to invest serious money in cleaning products to bring back the shine of you tub? I say to reconsider that, because harsh chemicals may ruin your bathtub more than cleaning it. Yu can use 2 natural products that are already in your home. Baking soda is very good for cleaning old stains. All that you have to do is mix 3 tablespoons of baking soda with the juice of 1 lemon, and apply the mixture all over the bathtub. Let it act for 30 minutes, and then wipe the bathtub with a sponge soaked in warm water. At the end, rinse the tub with plenty of water. White vinegar is ideal for cleaning and sanitizing the bathtub. All you have to do is fill the tub with hot water, and then add 3 bottles of white vinegar and 12 tablespoons of baking soda. Let everything to act for 3 hours, and then wipe it all with a sponge. Drain the water and rinse everything very well. 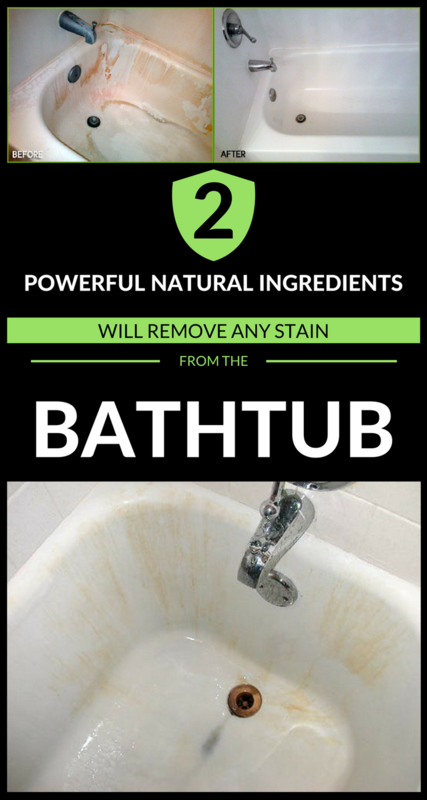 Your tub will be perfectly clean and disinfected!